As a company engaged in Big data before the term became as common as it is today, we are constantly having conversations around solutions that have a big data problem. 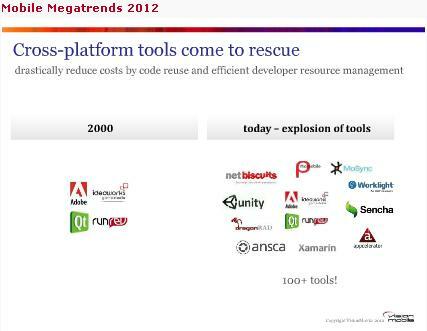 Naturally, a lot of talk ranges around Hadoop, NoSQL, and other such technologies. But what we notice is a pattern in how this is impacting business. There is a company that caters to researchers who till recently were dealing with petabytes of data. This is a client company and we helped implement our HSearch real time big data search engine for Hadoop. Before this intervention, the norm was to wait for upto 3 days at times to receive a report for a query spanning the petabytes of distributed information that was characterized by huge volumes and lot of variety. Today, the norm has changed with big data solution and it is about sub second response times. Similarly, in a conversation with a Telecom industry veteran, we were told that the health of telecom has always been networks monitored across large volume of transmission towers and together generate over 1 Terabyte of data each day as machine logs, sensor data, etc. The norm here was to receive health reports compiled at a weekly frequency. Now, some players are not satisfied with that and want to receive these reports on a daily basis, and possibly hourly or even in real time. Not stopping at reporting as it happens, or in near real-time, the next question business is asking, if you can tell so fast, can you predict it will happen, especially in a world of monitoring IT systems and machine generated data. We will leave predicting around human generated data analytics (read - social feed analysis) out of the story for the moment. Predictive analysis could mean predicting that a certain purple shade large size polo neck is soon going to run out of stock for a certain market region given other events. Or it could mean, more feasible, that a machine serving rising number of visitors to a site is likely to go down soon since its current sensor data indicates a historical pattern, therefore, alert the adminstrator or better still bring up a new node on demand and keep it warm and ready. So it seems the value of big data is in its degree of freshness and actionability, and at most basic level, simply get the analysis or insight out faster by a manifold factor! Even a decade back, when you say mention the alphabet V one thinks of powerful diesel engines. Today, some say data is the new oil and big data is best understood by the V words - Volume, Velocity, Variety. According to this IBM page these are not enough. Apparently, business still dont trust the output from any appliance or architecture that deals with these three V things. 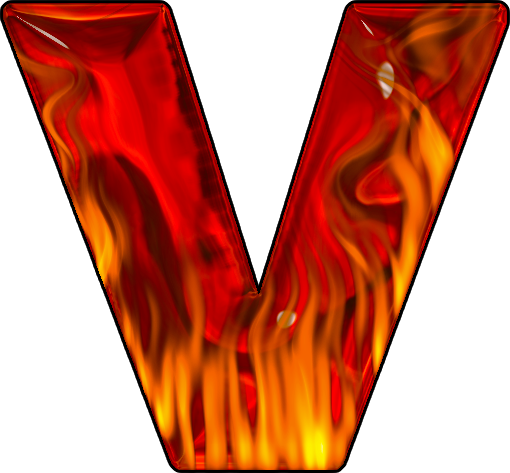 So they introduce a new V word - Veracity. With Veracity, you can establish or frame what you want from big data, and more importantly decide to believe it. Fair enough! Now, Evan Quinn of ESG Global, an IT research and advisory company, has added 2 new Vs to the string - Visualization and Value. Now that is a V6 engine! In a recent column "The New Algorithm of Web Marketing" in New York Times, Tanzina Vega reported how big brands such as Nike, P&G are increasingly relying on "programmatic buying" to deliver ads to individual consumers in a highly targeted manner, such that they are leaving the traditional cousins Print, TV, etc. way behind in the dust for the same promise. Till recently, it seemed algorithmic applied only to equity trading, but now ad buying has reached this. Publishers of online networks such as AOL and Weather.com apparently view themselves as "Marketing Engines" instead of Publishers, and are relying on automated ad purchasing technologies. Where traditional media only provided context, the new digital properties now add fine tuned placement to it. Just as brokerages earn in fractional value, but when volume is added to the equation, the results to top line of publishers promise to be handsome, naturally. The question I have is - granted context of a buyer and great placement are done in a timely manner to increase multi-fold the chances of viewer clicking the ad. But what next? Its an area Bizosys is interested in as to how dynamic or optimized is the post click experience. Seems ripe for innovation. Tell us! 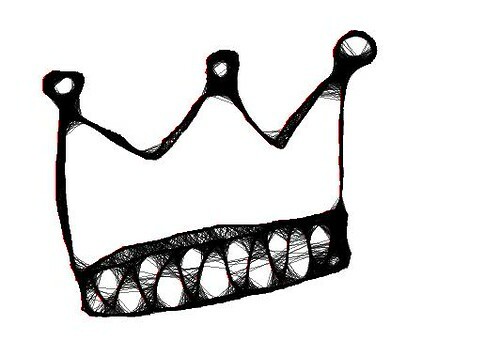 Chief Digital Officer - Yet another CxO or Democratization of digital Assets? Apparently, this is the hottest, newest title doing the rounds what with all the digitization of ads, operations, sensors, BYOD, and what not! We are in the midst of the digital revolution and it is Big data. And according to Dave Aron of Gartner who conceptualized this role, he paints the company as comprising of a back office for internal ops, front office for customer facing activities and experience, head office for strategic decisions around what business the company is in. Dave goes on to say, while there is digitazation at all these levels, while the CIO is traditionally about "automating and informating the processes" at the back office. On cue the CDO is expected to bridge this gap and cover the remaining offices to ensure "information and technology to drive value into and from the customer experience" and underlying all this digital is being taken out of its traditional place - consumer side stuff moves away from marketing, ops side stuff remains with CIO or the CIO takes it out with him in his/her path to CDO, sitting right next to the CEO. Whatever the role, however it transforms, the fact is digital data is big and it needs to be availabe wherever, whenever, and however while keeping costs down using Cloud or internal infrastructure to collate, manage and deliver all the data digitally. What are your views? Is this another annoying addition to the CxO basket of titles? Or is it democratization of digital assets internally. In a WSJ blog, Irving Wladawsky-Berger picked up the recent interest in Chief Digital Officer and lends his view that it is a classic debate of operations Vs strategic that plagues today's CIOs. It appears for now that CDO spans both and hence his/her value to the CEO, right next in line! Thomas Friedman, author of "The World is Flat" that reflects on globalization and interconnectedness, now says the same thing except it has become hyperconnectedness. In his typical eloquence he remarked at a Univ of Tennessee Hunter lecture Series that he delivered, "If all you ever do is all you’ve ever done, you will no longer get all you ever got. You will get less.” The rationale underlying this observation is about how it is not ok to be average, especially due to globalization and hyperconnectedness. In fact, he makes other erudite observations that 'the great American dream' is no longer a domestic issue but one of foreign policy. Hyperconnectedness is as much about globalization and IT commoditization, where data and people move effortlessly in the virutal space, and in large volumes. At Bizosys, we have tried to remain focussed on three emerging technologies - Cloud, Mobility, Bigdata. We always saw these as representing three trends that are obviously driven by the globalization and hyperconnectedness; and respectively they are Commoditization, Consumerization, Content explosion. It is easy to relate Cloud and Big data, especially where you have those terabytes or petabytes of data that you need to crunch quickly. Not stopping there, you want to get that big data insight, a nugget of information with immense business value but highly perishable, off to a connected Tablet or Smartphone device to be actionable, before it gets stale. And there comes the third piece Mobility, or designing an app in a Mobile First manner. Cloud, Mobility and Big data are not just related, but hyperconnected! And this is where Thomas Friedman exhortation to rise above average does not just apply to people but to all that data out there. So the message also goes to the CIO that "if all you ever do with your data is all you've ever done, you will no longer get all you ever got as insights. You will get less actionable information." And now, rising to this challenge, according to Gartner's Dave Aron, by 2015 25% of organizations will have a CDO or Chief Digital Officer. But then that I will talk in a next post. Last month, at Interop2012 held in Mumbai, India's leading IT body NASSCOM awarded Bizosys and 9 other IT companies the Top 10 "Made in India" Enterprise Software Product Companies recognition. Bizosys was chosen for its HSearch real time big data enterprise grade search engine for Hadoop that is available as open source on github. In continuation, Bizosys will be also participating in NASSCOM's flagship event the NASSCOM Product Conclave in Bengaluru, India on Nov 7th and 8th. Sunil Guttula, CEO and Co-Founder at Bizosys will participate in a panel discussion on the topic "Big Data - why enterprises are struggling and how startups can step in." Bizosys will also be presenting its story on moving from lab to the street that shares its GTM approach, challenges it faces, etc in a session titled "Enterprise Software Startup Highlight" where eminent IT and VC representatives will hear and provide feedback. Does it run on a smartphone? Steve Blank blogged recently Why Facebook is Killing Silicon Valley, and I quote "The irony is that as good as some of these nascent startups are....more and more frequently VCs whose firms would have looked at these deals or invested in these sectors, are now only interested in whether it runs on a smart phone or tablet." 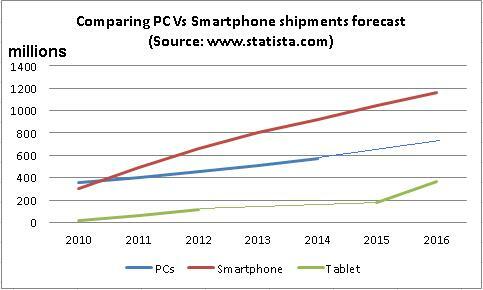 Why the emphasis on mobile computing? Below the sheen of easy money or quick exit, especially for today's near zero capital expense, no entry barrier ecosystem, thanks in part to Cloud based systems, there is a truth in user adoption numbers. 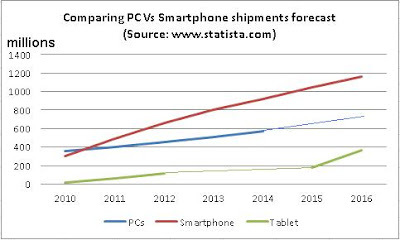 Take a look at this comparison of PC Vs. Smartphone shipments forecast (source:www.statista.com) and you realize why the VCs check for mobility access. The question really is not whether a minimum stated requirement i.e. to support a range of mobile devices is a triviality, but more a relevant user browsing behaviour change that is underway. So, 'That App' represents more than a specific app or a segment....and an entire behaviour. You remember those weird sci-fi looking bluetooth headsets for handsfree mobile in the early days, with people having frantic conversations with thin air? We are used to that now!